Join National Audubon (and automatically become a member of NHAS). 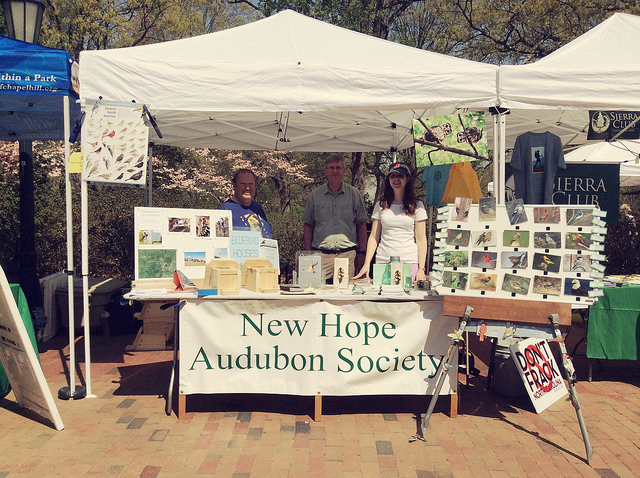 Join as a Local Member of New Hope Audubon (without joining National). Benefits of joining National Audubon include receiving the AUDUBON magazine and automatically becoming a member of your local Audubon, which will be NHAS if you live in Chatham, Durham, or Orange Counties. Joining as a Local Member, without joining National, will mean that your yearly dues will be used directly to benefit NHAS local projects and outreach. In contrast, if you join National, only your first year dues benefit NHAS. As a suggestion for families, one member of the family could join National so you receive the magazine, and another could join locally to benefit our programs. To join National Audubon click here to go to the National Audubon Society website. Yearly dues are $20 with $12.50 of that being tax deductible. Please enter R54 as the Chapter code for New Hope Audubon Society to assure your membership in NHAS. To join as a Local Member of the New Hope Audubon Society by writing a check, click here to download a form that you can fill out on the computer and then print and mail with your check to PO Box 2693, Chapel Hill, NC, 27515. Your dues are fully tax deductible. To join as a Local Member of the New Hope Audubon Society using a credit card or PayPal account, choose one or more of the options below. Please also fill out our online volunteer form indicating your interests. Your dues are fully tax deductible. Choose an amount using the drop-down arrow if you would like to make an additional donation.